I've been having some issues with memory being recognised. I seem to have narrowed it down to a couple of issues. The hardware is set to a standard A1200. 1. With A1200 Kickstart 3.0 (39.106), I can't get any memory recognised when added to the processor slot no matter which settings I choose. I'm adding it this way, as the default is to add Zorro II RAM, which didn't exist on an A1200, and is only 16bit, while the processor slot expansions were 32bit fast RAM. 68EC020 is 24-bit so you won't get any RAM outside of first 16M of address space. Perfectly normal. All automatically detected A1200 trapdoor ram-only expansions were Zorro II (with 32-bit data bus). ZII only means autoconfig mode, not width of data bus. Only accelerator boards can have RAM outside of first 16M because they have full 32-bit addressing capable CPU. But I'm adding only 4-8MB of RAM via the slot, so it's staying below 16MB RAM added. There were loads of real 32bit RAM A1200 expansions around like this, and they were fine with the 68EC020. When adding RAM to the A1200 via the Zorro II setting in WinUAE, it's shown as 16bit RAM according to sysinfo. With the processor slot, it's added as 32bit. Processor slot is outside of 16M address space. Ok. Is that just the way WinUAE configures the slot? The physical RAM expansions were configured in whatever way allowed the memory to be under the 16MB address limit. I don't know the technical details of how it worked though. I've been testing with everything on cycle exact and high compatibility modes. I haven't checked any benchmarks yet to see if there's a performance difference between the two, but I can try that. I've tried a couple of tests. 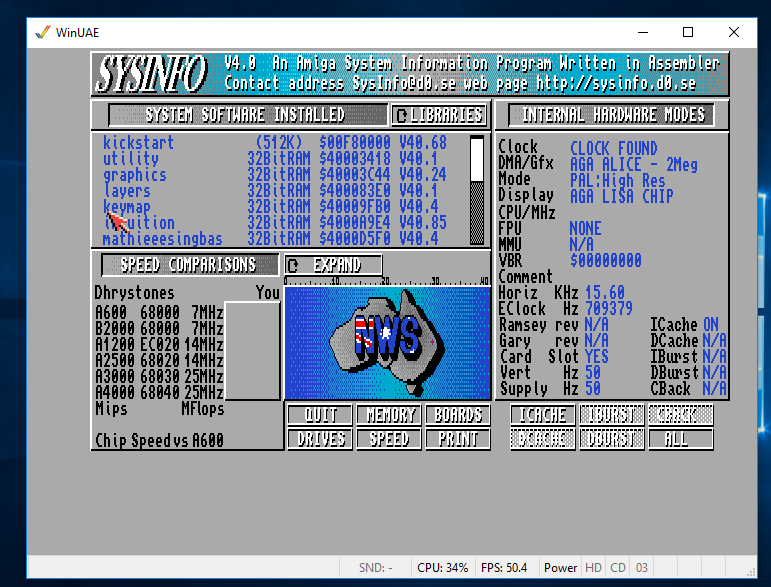 Configuring the A1200 cycle exact, with the only difference being 4MB of RAM being in the CPU slot and Z2 setting, the benchmark result in Sysinfo is identical (3173). However, the Z2 setting RAM is mapped at $200000 while the slot RAM is mapped at $800000. Perhaps Sysinfo is determining whether it's 32bit or 16bit simply by the address? Again though, processor slot RAM won't show up at all under KS 3.0, only 3.1. Last edited by teppic; 28 February 2016 at 19:16. I can't see nothing wrong. Processor slot RAM can't work with 68EC020. A1200 plain trap door RAM is autoconfig RAM (technically Zorro II but not 16-bit) starting from $200000. Don't trust any speed results, 68020 is not accurately enough emulated. What and where does it say about 16-bit? From what you say though, this is different from the CPU trapdoor expansions that had memory. 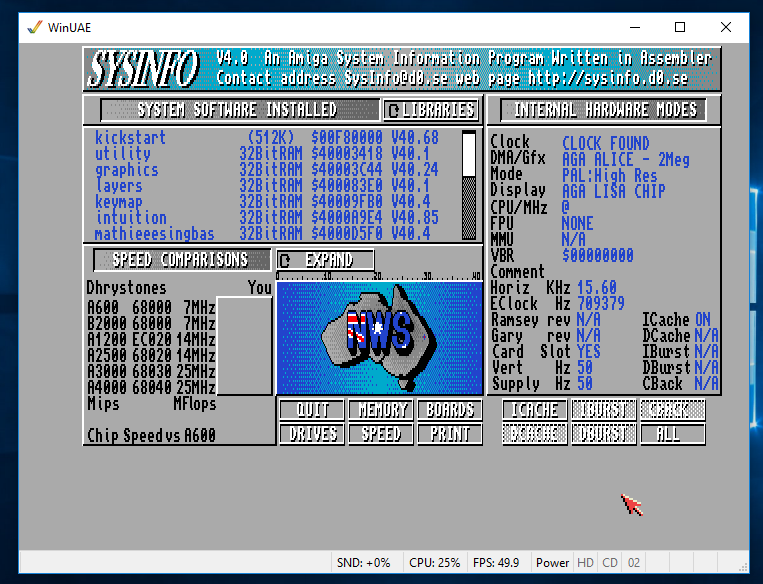 In Sysinfo it lists 16bit RAM on the A500/A2000 etc. as just "RAM", while 32bit RAM is listed as "32bitRAM" instead. Yeah, I meant those autoconfig RAM only trapdoor expansions. "Processor slot" is mainly used by A3000/A4000 boards but A1200 KS3.1 ROM also supports it. Attach screen shot, please. I can't see any 16bit messages. Ok, it sounds like I've just misunderstood what processor slot RAM means. In Sysinfo it lists all 16bit RAM as just 'RAM' (it never calls any memory 16bit), while 32bit RAM is specifically mentioned. I just had a look in the diagnostic ROM too. From looking at this, RAM added via the Z2 setting shows up as a Z2 expansion, while processor slot RAM is configured, but not listed with any Zorro expansion. 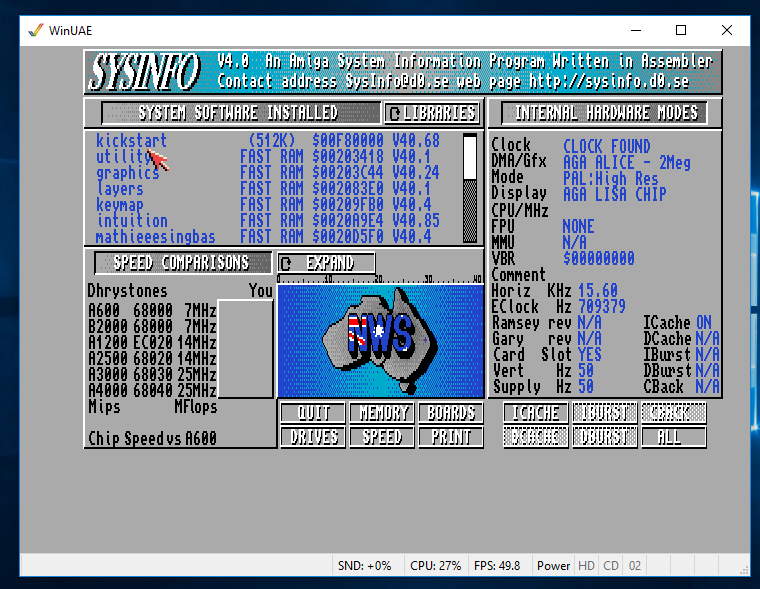 Sysinfo appears to list Z3 and processor slot RAM as 32bit, but not Z2 configured RAM. Last edited by teppic; 28 February 2016 at 20:11. That 32-bit probably only means RAM is outside of 24-bit address space, not that it has 32-bit (or 16-bit) data bus width. Yeah, that could be it. I think that all of the Z3, motherboard and processor slot memory gets put higher in the address space. If Z2 RAM is always at $200000 and limited to 8MB it's going to be max address of 10MB.